If you were visiting the locks in May of 1916 this is what you would have seen. This view taken from the railroad bridge shows the completed large lock with all the gates kept open to allow the tidal flow into Salmon Bay. The small lock is not yet done, there are still cofferdams at both ends so work can continue within the lock. The slope west of the administration building has been terraced as we see it today. On the south side of the canal work is progressing on the spillway dam with the spillway and the lower apron about half completed, the dam will be finished in about 3 months. 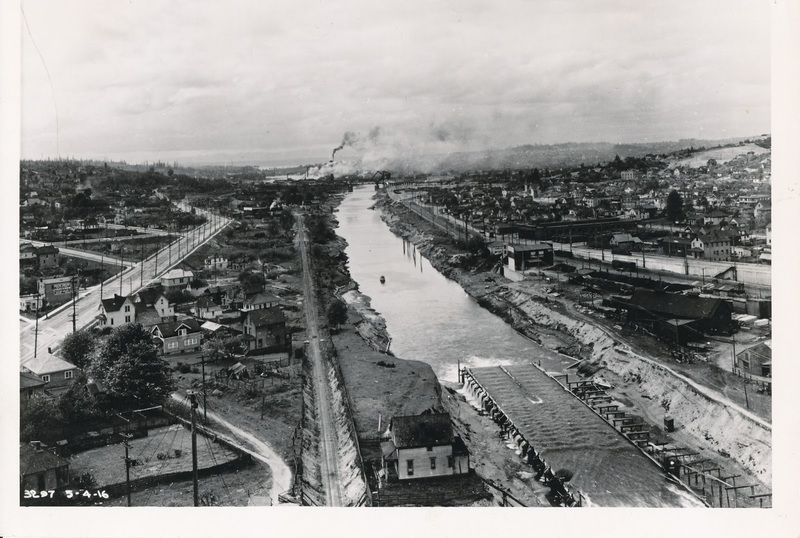 This photo is taken from the Fremont bridge, the newly dug Fremont canal heads westward toward the shingle mills at the head of Salmon Bay. The lock site is further west in Salmon Bay, in 10 weeks the gates of the locks will be closed to flood Salmon Bay to its current height of 20 feet above sea level.